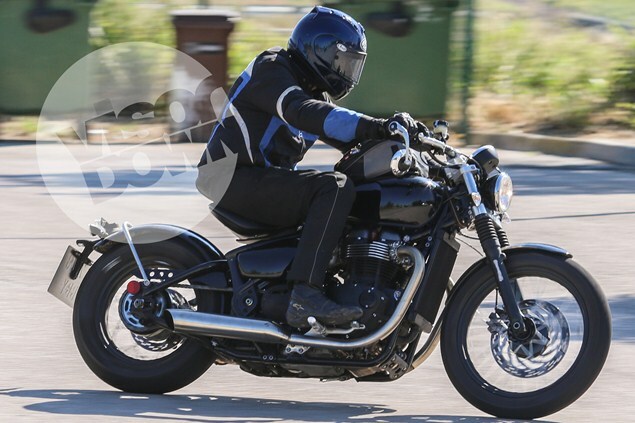 HERE’S a surprise new bobber edition of Triumph’s Bonneville, spotted being tested near the firm’s Spanish development facility near Barcelona. It uses a new liquid-cooled parallel-twin engine believed to be around 1100cc, offering significantly greater performance than the current Bonnie’s 865cc air-cooled twin. Power is expected to be up from 69hp to around 100hp. The bobber is one of a whole new family of models which Triumph is developing around the new liquid-cooled engine, including a replacement for all the existing Bonneville range, which includes the wire-spoke-wheeled T100, café race-styled Thruxton, Scrambler and base edition. There's also a new, sportier café racer which was photographed during tests last year, using upside-down forks and Brembo calipered twin-disc front brakes and powered by the same 1100cc engine. The new engine’s twin cylinders retain fins for a classic look but the bike’s large radiator shows it’s actually water that’s doing the cooling. The solo seat and swing-arm design contribute to a hard-tail bobber look. The exhaust diverts into a catalytic converter visible underneath the engine in our picture, while a cover over the junction in the pipe creates the look of a straight-through system. Although the machine looks production-ready, it's anticipated to be a 2017 model. Other editions of the new Bonneville range are expected to be unveiled this autumn for production next year. It's part of a major development push by Triumph for 2016, with other models on the way including a new Speed Triple and Tiger Explorer.